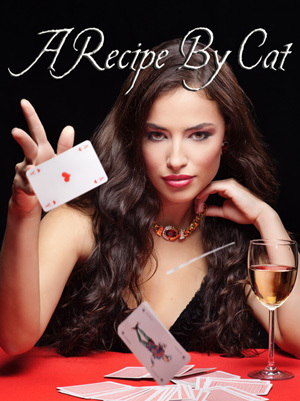 Blackjack dealer, Catalina makes breakfast for her new husband, Zeb after a night of hot love-making in Seducing Zeb. Zeb’s nephews have given her eggs from the hen house and vegetables from the garden they’ve just harvested, and she decides to make him a dish that was at one time her mother’s favorite. Cat, will you tell the readers all about it? Cat: Yes, of course I will, Elizabeth. I just want to say, I don’t really cook a whole lot. But this dish is simple to make and it seemed to impress Zeb. So if I can do it, anyone can. Here’s the recipe. 3 Tbs Extra Virgin Olive Oil – heat in a pan after you’ve chopped up the veggies. 2 Yukon Gold Potatoes – Chop them into small pieces and add them to the oil over a medium heat to brown until they are soft, stirring as needed. Salt and Pepper– Sprinkle some atop the potatoes as they’re cooking. 2 Mini Colored Sweet Peppers – Take out the seeds and chop these and add to the potatoes when the potatoes start getting soft. 1/2 cup Zucchini – Chopped. Leave skins on. 1/2 cup Broccoli flowerettes – chop and add as well. 1/4 cup Onions (optional) – Chop and add to mixture for more flavor. 2 Cloves Garlic – Mince and add to pan. Do this near the end so it doesn’t burn. 1/2 cup shredded Colby/Jack Cheese – After the veggies are all soft, sprinkle the cheese atop and remove from heat and cover so the cheese melts. 2 Basted Eggs – While the cheese is melting, cover the bottom of a small pan with water and bring to a boil. Then crack and drop in one egg at a time. Cover the pan and cook for about two minutes or until the egg yolks look a little white on top and the egg whites don’t look shiny anymore. 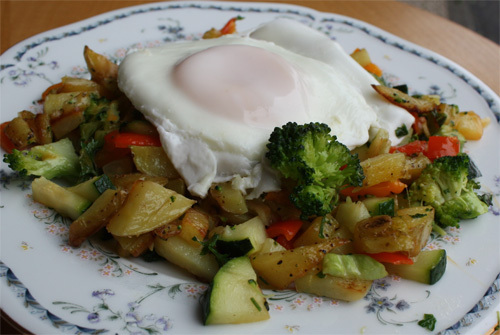 Place the veggie mixture on a plate and put an egg on top carefully. Serves 2.